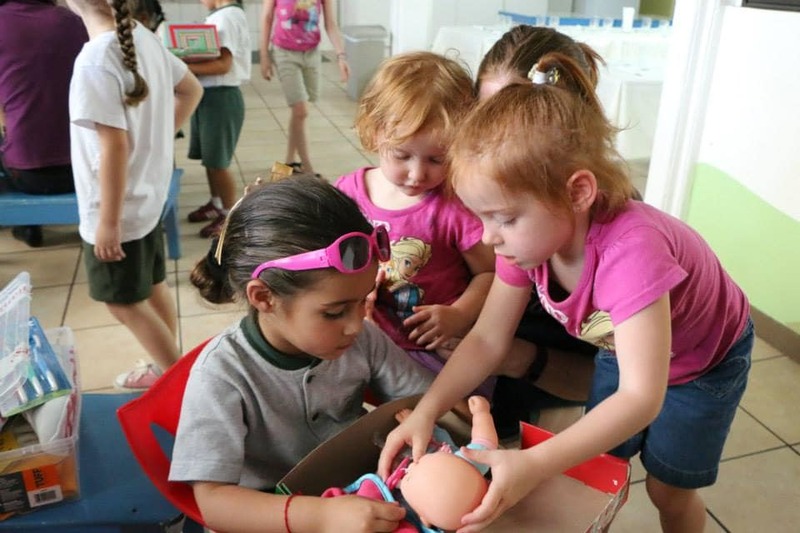 Our family was able to participate in an Operation Christmas Child distribution last week in Costa Rica. Yes, they distribute the boxes year-round! Here are some lessons I learned from participating in the distribution. 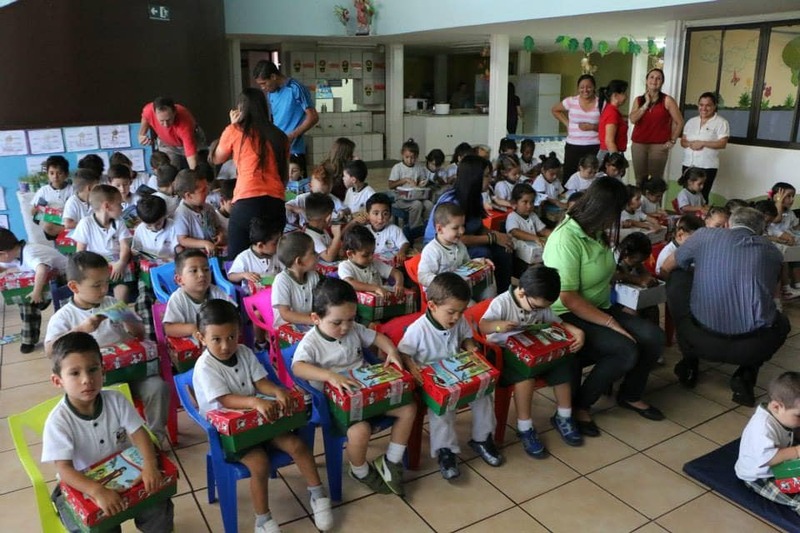 Last week, our family had the amazing opportunity to participate in an Operation Christmas Child shoebox distribution in Cartago, Costa Rica! We have been packing Operation Christmas Child shoeboxes for years. We started the tradition before we had kids, and once our firstborn was around two, we had her join us in picking out items and helping to pack them. When we told our girls that we were invited to participate in the distribution, they immediately knew what we were talking about because they remembered how we pack the boxes each year. They were excited to see children receive boxes similar to the ones they pack! After the distribution, I was able to sit down with the Costa Rican coordinators of the program and ask some questions about how those in the U.S. and Canada can better pack boxes and serve the children receiving these boxes even better. 1. Plastic boxes are helpful. Operation Christmas Child provides free cardboard boxes that anyone can use to pack. They have also introduced their own plastic version that can be purchased on their website or at Hobby Lobby. These plastic boxes have been tested to withstand the rough shipping process as well as the drastic changes in temperature that can occur. You can also find boxes at local big box stores. The most basic ones cost around $1 or so, but these may not hold up while shipping. You can find some sturdier ones for under $3 or use the ones from OCC. The box itself then becomes an additional resource that the family can use for storage, etc. Operation Christmas Child will put tape around each box to ensure it stays closed. 2. Little girls love princess crowns. Even though our family has chosen girls to provide boxes to each year (in the ages of our own three girls), I don’t think we have ever packed a plastic princess crown. We distributed boxes for ages 2-4 and 5-9. Several of the little girls in these age groups received crowns, and they put them on immediately! One of the coordinators told me that many of these children come from very poor families, and princess attire makes them feel like they really are princesses. 3. Candy can do more harm than good. Candy is not allowed anymore with Operation Christmas Child. 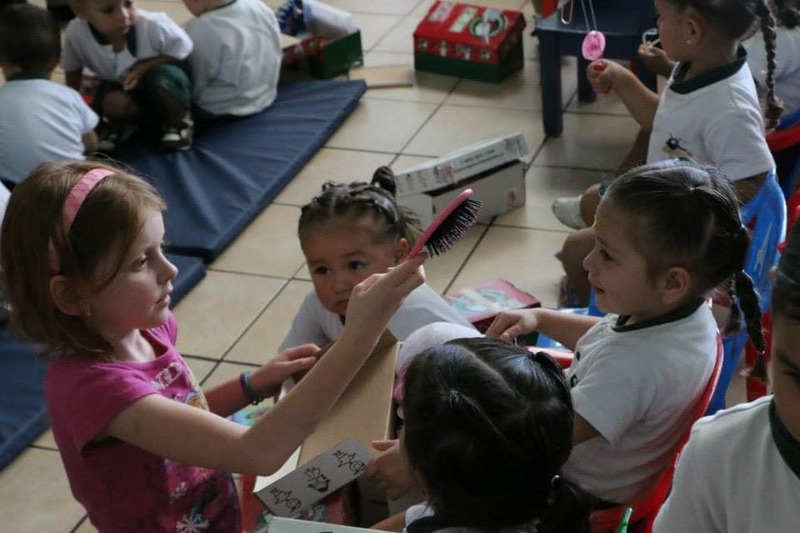 It’s not something that those in Costa Rica, at least, feel is very beneficial to the children. For one, it can cause cavities, but, even more than that, in warm climates like in those countries in Latin America and much of the rest of the world, candy attracts bugs, mice, cockroaches, etc. In addition, even though the boxes are donated in mid-late November, many times the children do not receive them until months later. One little girl opened up a box that had melted caramel candies all over the rest of the box’s contents. 4. 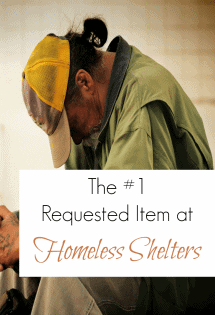 Each box should include items you would want your children or grandchildren to receive. I could tell that some boxes were just thrown together with things that looked like they came out of junk drawers. And while some boxes were brimming with amazing toys, school supplies, and toiletry items, others did not include much at all. I honestly felt sorry for the kids who did not get very much while the children on either side went home with enough for several kids! Make each box special. Include now WOW item like a doll, stuffed animal, or ball and pump. Don’t just haphazardly pack it. Pray about what you will pick out to go into it. Don’t just unload your junk in the boxes. Try not to include McDonald’s, etc. Happy Meal toys. Some of these toys come with small parts, are associated with U.S. movies, etc. and are just not very special or even useful to the children. Try not to include games, books, etc. that are written only in English. Try to stay away from movie characters that may not be recognized or may be misunderstood in other cultures. Some rural areas of some countries view magic and other supernatural forces as very real, so use caution with characters or items. Some have asked me about Dollar Store toys: I would just be choosy. I saw some kids with toys that were already breaking at the distribution. You want to make sure it’s something that will last. balls (with pump)–one little boy received a ball with a globe on it, and the family had drawn on the map where they lived in Canada! * As of 2017, all types of toothpaste, tooth powder, baking soda, and/or pre-pasted toothbrushes are officially inappropriate items in the U.S. Due to increasing customs regulations, all items with an expiration date have become items of regulatory issue, often causing complications with the delivery of shoebox gifts…We encourage you to consider included a toothbrush, as this item will not cause problems with customs regulations, and a child’s oral hygiene can still be improved through regular use of a toothbrush alone. All that said, the coordinators of the Costa Rican program pointed to the fact that God is sovereign. I had expressed that I felt sorry for a little girl who received a pair of shoes and not much else. The shoes were way too big for her feet, and it will take years for her to grow into them. The children on either side received baby dolls, pony toys, and more. The coordinator reminded me that God is sovereign, and even though this little girl’s box did not appear to be much, perhaps He has a greater plan for it and the shoes that came in it. Maybe she has an older sister who needs a new pair of shoes. 5. The gospel is really shared at the distribution. Each box comes with a little booklet that explains the gospel to the children in their own language. I am not sure how it works at other distributions, but at the one in Costa Rica, the coordinators also presented the gospel via some music, music videos, and a short message before giving out the boxes. 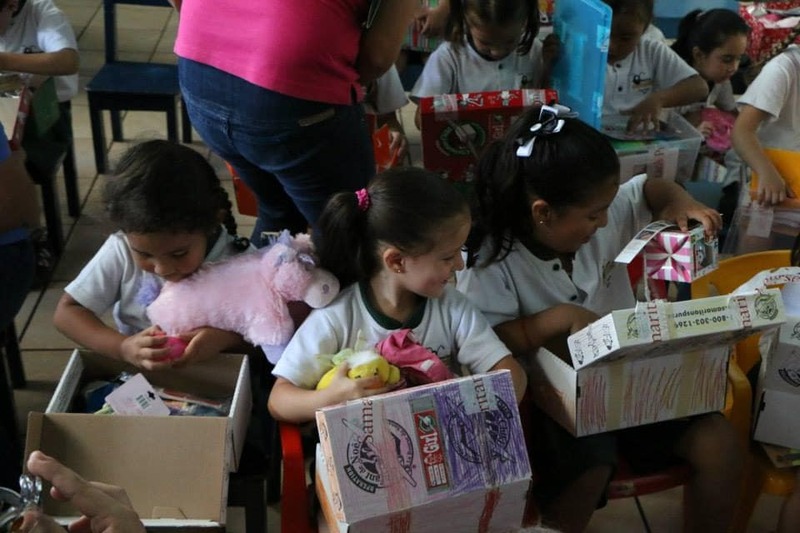 Operation Christmas Child shoeboxes really do make the children smile! I know we will continue to pack them each year. Has your family ever participated in Operation Christmas Child? We started filling a shoebox for Operation Christmas Child before our son was born 9 years ago and now he looks forward to shopping for his adopted “shoebox” brother. We try to fill one for a boy the same age as him and we start looking for toys and school supplies when shopping for his school supplies in August…much better deals then. This is a great way to teach our kids that other children do not have as much and that it is much better to give than receive. We have helped with packing the shoeboxes into the shipping crates to be sent to the distribution center and also dedication ceremony. Thanks for tips and suggestions…I will pass the word along. My Barbies will not fit in the shoebox. Is it ok to take them out of their boxes? Yes, you can take everything out of the individual boxes to make them fit in the shoeboxes! Take as much out of the original packaging as you can. The items will fit better, and there will be less garbage on the other end. They don’t have garbage pickup as we do. Or get a bigger box. We never use the free boxes because they don’t fit a standard coloring book. That’s my personal size requirement. I LOVED this Erin! So spot on. I’ve been on the reviving end many times over the years and seen the great boxes and the ones that didn’t really fit the kids and their needs very well. I am so glad you shared this! Thanks Katie! It really was special for me and a great reminder of God’s sovereignty. THANK YOU! You are the first blog I’ve ever seen to even mention number three! I’ve been on the mission field helping another ministry get ready to distribute and hundreds of boxes were chewed through and destroyed because of candy! I don’t know why they allow it. Please please don’t pack candy or scented items. The shoe boxes are packed into larger moving boxes and even one shoe box can cause the others to be ruined with chew marks and rat urine. It was so sad. And the fact that these boxes rarely get delivered at Christmas time, just think about sticking candy in a box in your storage unit or garage in the summer and expect it not to be torn to shreds in 6-8 months. Thank you so much for sharing all of this!! I’ve been told that OCC in USA will phase out the candy soon. I think the kids love a treat, but pack a small amount, double-wrap it and put it into a plastic box or water bottle. Yes as of 2017 candy is no longer allowed in any box as well as toothpaste. Thanks Erin, you brought a smile to my face! My daughter’s always had fun packing their boxes. I wish I would have taken pictures of them and their boxes, would be so fun today to see what they chose! You are an awesome Mommy, you are teaching your girls the best things in life. Any stories involving kids and real life are the best! When my girls were around 10 and 12 I started volunteering at a crisis pregnancy center 4 hours a week. I would often bring my girls with me, they would clean and empty the trash. While doing so they would see these young girls in the waiting room and always ask me later if the girl was pregnant and if she planned to keep her baby. Learning values is much easier this way than lessons from a book! Thanks for all you do! I hope your girls love the monkeys in Costa Rica! I am so in love with OCC! 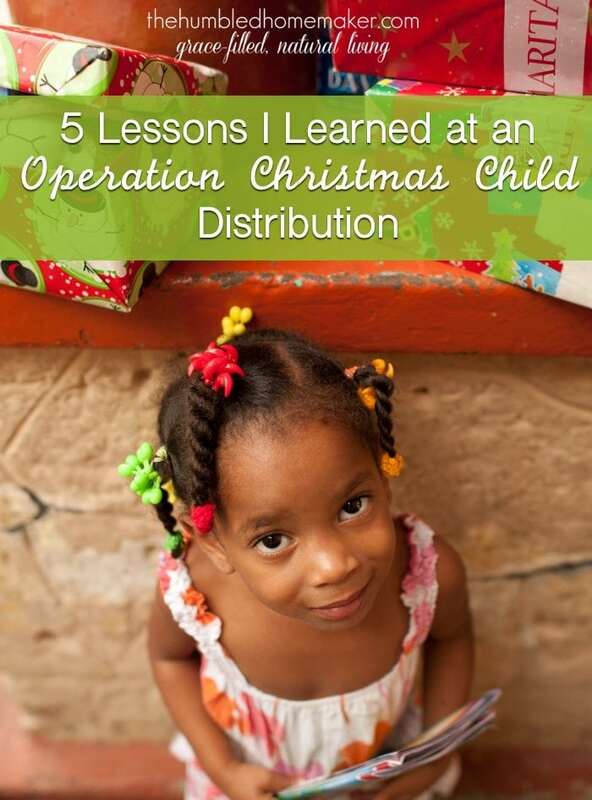 Thanks for sharing your experience–I went to the Dominican Republic with OCC a few years ago and it changed the way I look at boxes. Each box represents one child, which represents one opportunity for the Gospel. It’s just an amazing ministry! My family has not participated before in OCC but we usually do local Angel Tree-like programs. Thanks for the reminders and tips! Thank you for sharing your experiences Erin! This really is such a helpful post for us to think about what we pack each year. I also love that you pointed out that God is sovereign over even the contents of the boxes and to whom they are distributed. That is so true and we never know the full story of how He can turn even the seemingly insignificant into something purposeful for His glory. The pictures of your little girls are so sweet. What a blessing this trip must be! Thanks Erin for sharing this- I just found out about it 2 years ago and started participating. It is helpful to hear what is most liked and not. How awesome you and your family were able to participate in the distributing. It is always nice to see how the kids liked their gifts! This is a great article and really good advice on packing the boxes. (P.S. Canada will not allow candy in the boxes from here on out, just FYI). I am so excited to start my job with OCC on July 6!!! I am all about the shoeboxes this year! Love this post, Erin! How wonderful that your family was able to attend! My family has supported this ministry for years, but it is wonderful to hear from someone who has seen it firsthand. Thank you so much for sharing your experience with us. I wrote a post last July called “Christmas in July” where I encouraged people to begin thinking now about Christmas so that we can be ready (financially) to give generously to those who have so much less. I was encouraging people to participate in Advent Conspiracy but one of the ways we do that is by packing shoeboxes for people on our Christmas list in lieu of a Christmas gift. It is so important for us to think outside of our comfort zones and give generously. Thanks for the encouraging and informative post. You have given some great tips to consider. This year, I’ve decided to pack my items in a plastic shoebox instead of the cardboard box. My thought is that it will hold the child’s treasures better. A good-quality plastic box is part of the gift, and can be used to store rice or carry water if needed by the family. The shoeboxes from The Container Store do not break and are food-safe. They also fit in the same space as the OCC cardboard boxes. A plastic box is a great idea, as it is part of the gift! I always get my shoeboxes at The Container Store. Their boxes are high-quality, unbreakable, and food safe. I buy a box of 20 at a discount. I worked at the Baltimore processing center last November and we processed a lot of plastic boxes and none of them were cracked. We speculated that the milder temperatures were helpful, as it’s the cheaper shoeboxes that crack in cold temperatures. Where in Baltimore is the processing center? Just south of Baltimore. they rent a warehouse for the holiday season so it’s not the same location every year. This is my first year making shoe boxes. I have 2 completed and 2 almost done. It was so sad to read about the children who get disappointing boxes. I knew there had to be people giving lousy boxes (there’s always some screwball messing things us) and wondered if they might top up the boxes when they are checking thru them but I guess not. I’m wondering now if my boxes might be disappointing to someone. I’ve made all the boxes so far for girls 10-14 but there is a big difference between a 10 and 14 year old. My boxes have school supplies, toiletries, and tee shirt or hat&sunglasses and 1 small stuffed animal. Can’t really get anything else in the box after that. I thought its good for a teenager but for a 10 year old who still likes toys maybe not so much. Girls ages 10-14 might need some supplies to help manage their periods. daysforgirls.org is a wonderful site that has reusable pads you can purchase (kind of spendy) or patterns to make them. Maybe you could add that to your boxes? Check out the site and see what you think! At the processing centers volunteers add “filler items” to boxes that need more. However, the filler items that are available at any particular time might not be what’s needed for the box being worked on just then. We have to work quickly, so some boxes have to be passed through with less than the best inside. It’s too bad, but hopefully some of the kids share with each other! I wouldn’t worry. Your box sounds good. I think the issue is with people who are trying to do quantity over quality. Sure I could make 10 crap boxes full of junk or I can make 5 good ones that are well thought out. I choose the latter. How interesting, in Australia, we are not allowed to include food, toothpaste or anything ‘religious’ and I know that all the shoe boxes get sorted in a major centre so that the boxes have similar things in them. I am an Area Coordinator for OCC. Plastic shoe boxes are great. They have multiple uses for the child and there family. When I am asked about weather people should us them I always encourage them to. With a side note that the dollar store ones are not good for this purpose. I encourage people to get the Sterilite ones they work great I have never had to replace one when packing the big cartons. Such a great tip! Thanks so much! We did not know that about the dollar store ones! It depends on the processing center how things are handled. Our processing center sends boxes to 5 specific countries, and the boxes are sorted by what is allowed in those countries. For the places where candy isn’t kosher, the boxes that come without it go in that pile. The country that has severe weather gets the boxes with mittens and gloves, the warmer countries get the boxes with the flip-flops. The only things ever removed are those on the do-not-send list: war toys, liquids, chocolate/meltable candies (hard candies stay), glass/breakable items. If the box is low on content, things will be added, but each processing center has different things available to be added so I wouldn’t count on that. Better to fill your box up good from the start. Also, over the years we’ve trained our project leaders to stick to women’s medium sized boxes and avoid boot boxes and larger mens boxes. It helps when packing the shipping cartons, and keeps the contents more fair. That said, as Erin mentioned, God is ALWAYS sovereign. He knows exactly which kid needs which box. We pray, and He takes care of it from there. Thank you so much for explaining how these boxes get sorted. We put a variety of things in them, and the children have often said”What if it’s cold out, and they receive flip flops?” My answer has always been ‘Jesus will work it out for His Glory, for that is His job !” We all firmly believe this. Each year that goes by, we try to do more than the last, and this year our family put together 239 boxes . Praise Jesus , as all the Glory is His ! To everyone who has sent boxes out, you are doing something very special for these children, and God will Bless all of your Kindness ! Thank you so much and God Bless You and Your Family! I think all kids can use flip-flops, in any climate, indoors or out. Also, hats and mittens are used in every climate, so I’ve read, even in the tropics. In the processing center where I volunteered, there was no sorting like that. All the boxes in one carton were inspected and re-packed into a carton for a country. Variety in your boxes is great! I coordinate a packing party for my church and appreciate your helpful tips! The only thing I would comment on is that stuffed animals aren’t always a good choice. In some countries various animals represent things and ideas that cause more fear than good. And, based on others’ experiences, little kids are sometimes scared of the stuffed animals. We don’t have this situation at our processing center, but I have heard that at one of them, there is a country that doesn’t allow farm animals to be included in the box, so they make sure any boxes with things like stuffed pigs don’t go into that country’s pile. I have a missionary friend who was part of a distribution (my someday hope!) and she said that the stuffed animals were a huge hit. So I think it really does depend on the receiving country. I try to pack a stuffed animal because you can see in the many posted videos how much the children love them!! We need to use good judgment in packing animals that are kid-friendly, though — not anything scary-looking. Teddy bears, bunnies, chicks, monkeys in pastel colors are all good. Thanks for the tips! You sound like you are an OCC rockstar!! Love your ideas, Lois! Thanks for sharing!! Since my son is 12, we choose to pack for older boys. We always start with a plastic shoebox so the child has something permanent to keep their treasures in. I include several t-shirts, baseball, tennis ball, small foam football, bouncy ball, baseball cards, pens, pencil, notebook, calculator, flashlight, extra batteries, toothbrush and toothpaste. I had included bubble gum in a ziplock bag, but may skip it this year. I was going to say the exact same thing!! This post was right on and had many many awesome ideas! I learned this year that I had been packing poorly and didn’t even know it in years past!! Although I didn’t have cheap items, I wasn’t thinking out of my “American” mindset!! But, I did read another post stating that the stuffed animals, stickers, books and anything with animals might scare a child in another country. Owls was the example! I would have never imagined an owl would scare them! But, they are evil in some countries! Great post! Thanks!!! I have read the same thing about owls. In many cultures they’re an evil omen. One story had a girl opening her shoe box and bursting into tears because there was a stuffed owl on top. I wish OCC would post a list of what animals might be offensive. I have packed owl theme boxes in the past not realizing! That’s a good question to ask. I’ll update this post sometime. This was a great article. One thing that we tell people in our area to do is use zip lock type bags. We double bag our soap so the smell doesn’t permeate everything. We also put all our candy in zip locks. This helps in any thing that melts will not get all over everything. I’ve never heard about rats before. Interesting! I’ll keep it in mind. The rubber bands would be a good idea except that at our processing center all the rubber bands are removed from the boxes and they are taped closed. If you want them to be able to use rubber bands, put them inside the shoe box. This reminds me of one of the churches where we used to live. They folded a black plastic bag in the bottom of every shoebox at their packing parties so that the child had something to carry it home in. I thought it was interesting, although I’ve never done it. Maybe I should. I pack unscented soap so there’s no heavy scent. It’s also better for children’s skin. I wrap the bars in plastic bags and put them inside a soap box or snack box, with a soap saver underneath if there’s room. I have no idea why folks pack scented soap, except that it’s cheaper, maybe. You have no idea why people pack scented soap? Well, let me tell you. I don’t pack for OCC but I pack for a similar shoebox appeal charity and the concept is the same. I have a lot to say on the topic of gifting scented products to poor people, because I feel very strongly about it due to personal experience. People pack scented soap because some of us have actually BEEN to Third World countries and / or places of extreme poverty, and have volunteered there and lived amongst the people in the same kind of accommodation and conditions that the locals are forced to endure, so we know how much of an amazing luxury a beautiful scent can be when given to people living in poverty who are surrounded by daily drudgery and smells of animal dung and decomposing human excrement in their communal “toilets” that are just holes dug in the ground. Going on an expedition to hand out OCC shoeboxes for a few days while staying in a comfortable Western bubble (probably in the luxury of a hotel) and then flying back home again is not the same thing as actually volunteering for a longer period of time in a poor community, and living like the locals, in accommodation comprising a little shack with no plumbed toilet, no washing facilities, no refrigerator, and no stove. If you live amongst those kind of people for a while, your perspective changes, and you understand their points of view. I can tell you that sending someone the gift of a sweet smelling soap will be like sending a little ray of amazing smellable light into their filthy stinking world. I volunteered in rural Romania and lived among the people for a month and the smells…the smells were just indescribable. The stink of the outdoor “toilet” which I used during my time there was a cesspit of seething worms churning inside a brown sea of liquid sickly decomposing poop, made indescribably worse by the extreme summer heat. “Don’t look down” they told me. “Don’t look down into the hole when using the toilet”. But of course, when they tell you not to do something, you become curious, and want to do it. So I made that mistake: I looked down. Never, ever look down into the hole of a cesspit in high summer. You will see a MASSIVE sea of writhing worms wriggling inside a liquid sea of brown. Each time nature called I had to go there to the cesspit and try not to throw up and had to hold my breath during the entire experience to avoid gagging from the absolutely revolting smell. Who wouldn’t want to be sent something sweet smelling when their daily reality involves so much exposure to foul odours? The smell of a massive deposit of decomposing human faeces and urine is not a smell you will be familiar with if you haven’t used a cesspit. Most pampered Westeners are only familiar with the smell of FRESH poop, because they have the luxury of plumbed toilets. If you think the smell of fresh poop is bad, I can tell you that it is NOTHING compared with the indescribable sickly horrifying stink of DECOMPOSING excrement and urine that has been left to sit there and stew for many years, and is being eagerly gobbled up by a sea of fat, juicy, healthy, enthusiastic worms. If you have not lived with the reality of a life with no plumbed toilet, you will not understand just how nice it is to be given the gift of any sweet smelling item to brighten up your life amidst the daily drudgery of having to walk across a field several times a day to squat above a stinking hole from which an indescribable cloud of stench is overpowering you. Please understand that the people who receive these shoeboxes do not live inside your sterile, sanitised Western bubble. When in rural Romania I learned how the poor women in rural Romania had to make their own basic soap out of things like animal fat, and had no perfume to add to it. So they DREAMED of one day owning their own bar of beautifully scented store-bought soap. Can you imagine wistfully DREAMING to aspire to merely one day own a bar of scented soap or scented shampoo? No, you can’t. You have all that already, so you have different dreams. Perhaps you dream of being famous, or being rich(er) than you already are. 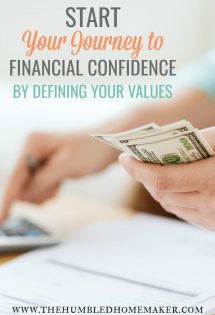 Perhaps you dream of being more beautiful or more healthy or more privileged than you already are – of owning an even bigger house or an even better cellphone than the one you already have. But can you imagine spending your life merely longing that one day, somebody would give you a store-bought toiletry product that had a beautiful perfume? Longing for scented products so much that it becomes an all-consuming longing and you feel that you could die in peace if you were just lucky enough to one day experience the luxury that Western women have (of being able to adorn their bodies with beautiful smells whenever they wish) is something very common for the poor women I met in rural Eastern Europe. I can’t speak for the women in Africa and Asia, because I haven’t been there, but I would assume it is the same. 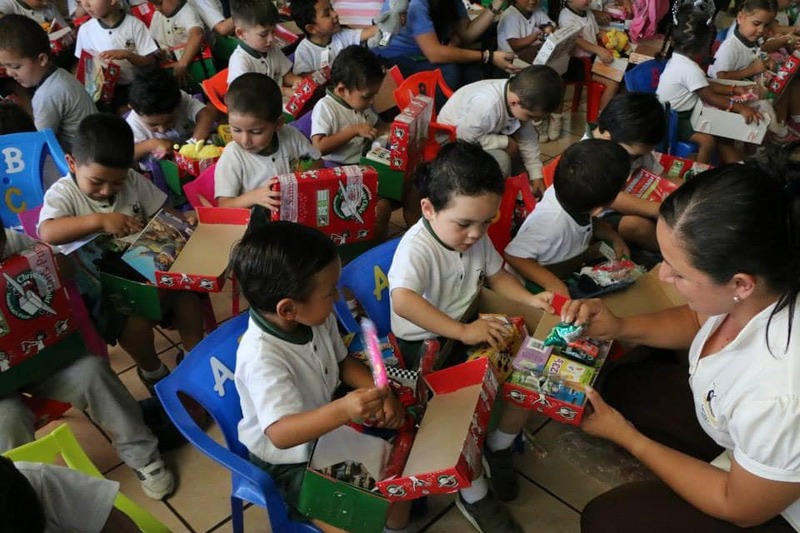 Many of the children who receive shoeboxes will take the contents home and hand it all over to their mothers for inspection and the mothers may take the soap for themselves, because they understand what it is, and have been longing for it. The child may not understand. Unscented soap is a concept made for affluent people who are already so pampered and have so many washing facilities and other scented products to layer their bodies with that they have no body odour to mask, so have no need for yet another artificial scent. Unscented soap is for rich people. It is not for poor people doing manual labour and sweating in the heat, while grinding their own flour and working the fields and in the brick factories, and pulling rickshaws. Poor people want (and desperately need) to smell nice. You come from a reality in which you don’t have to do hard manual labour for a living and all your hygiene and cosmetic needs are met. You can walk into your bathroom any time you want and can conveniently flush away your excrement for somebody else to deal with, so that you never have to smell it when it starts to decompose. Then you can wash your hands or face or hair with any of a dizzying array of beautifully scented products. Third World people are not like that. They are filthy poor and have no running water or deodorant or makeup or plumbed toilets or heating or electricity or refrigerators or nice smells. Their poop is rotting in holes in the ground and they are forced to endure the smell as it rots and is consumed by worms, and their bodies smell bad because they have no showers or baths or scented products to mask their odour, their food is rotting and surrounded by flies as soon as they buy it because there is no refrigerator to keep it fresh in summer and no heat to thaw it out in winter, and their houses are pitch dark at night because they have no light, so they can’t see their crying babies’ faces and their children can’t do their homework because they have run out of candles. Can you please understand that? A scentless bar of soap, while it may assist in cleansing the skin, is not very exciting to receive as a sensory experience. It’s just a hard unscented lump, whereas a beautifully scented one will be a delight. There are many testimonies of people who received bars of scented soap in shoeboxes and didn’t use them to wash but just kept them as treasures, and kept taking them into their hands again and again and smelling them in wonderment over periods of several years. A bar of soap that is elaborately decorative (made from a mould and shaped to resemble a rose or something similar, and looking like a carved sculpture) will be even MORE amazing to them than a plain smooth bar. They will think it has been carved by hand, and will think that you have just gifted them an exquisite marvel. If you send a child living in abject poverty a scented bar of soap, they will smell it in wonderment when they open their shoebox because they will probably never have smelt anything like that in their entire life. People packing boxes complain about their concerns of smell contamination, and about the possibility of the smell of soap penetrating the other items. Have you not stopped to realise that the child may actually LIKE the fact that all the other items in the box may have the faint smell of Western soap? With the exception of sweets / candy (nobody wants food that tastes like soap) the recipient would probably be very HAPPY if their T-shirt, tennis ball, cuddly toy, shoes, etc all had the beautiful lingering smell of perfumed soap in them. In fact many poor people, when given a bar of scented soap, take it home and wrap their clothes around the scented soap in a deliberate attempt to make the smell of soap penetrate their clothing. These people don’t have washing machines or laundry detergent or deodorising sprays like you do. They have nothing to make their belongings smell nice. The child will probably have no idea what a lot of the items in their shoebox are, and they will investigate them with their noses and may try nibbling at them, to determine whether they have a scent and whether they are supposed to be for eating. A child investigating a bar of scented soap with his/her nose will notice the beautiful unfamiliar smell and will probably treasure it and keep it safe and may instinctively try to transfer the nice smell to other possessions by rubbing the soap onto them. Even if somebody tells them what the soap is actually meant to be for, they may not wish to use it with water for washing because they may not want to spoil it or use it up. Alternatively, they may take the soap home and give it to their mother, who will probably weep with astonishment and amazement that such an amazingly luxurious treasure has been sent to her. You people need to stop taking your Western luxuries for granted and need to learn to think from the perspective of poor people when packing your shoeboxes. You are NOT packing for Western kids. You are packing for foreigners living in abject poverty. They have no electricity. After the sun goes down, they rely on the moon. If the moon is covered by the clouds, they cannot see AT ALL. Hence, as well as scented soap, a wind up torch would be an absolute GODSEND to them. (Sending them a torch with batteries is good, but when the batteries run out, they have no money to buy more). The same is true for all the comments saying “candy / sweets are bad because they give children cavities”. That is also the reasoning of an affluent Westener, whose children are potentially being exposed to candy/sweets on a daily or weekly basis. Regular consumption of sugary things will indeed cause cavities, but one single isolated session of candy eating as a treat will not give a poorer child cavities. Banning candy / sweets on the basis that they attract rats and may leak into the boxes is sound reasoning, but banning them due to fears of “cavities” is nonsense. You will not get cavities from something you eat only ONCE. Please exercise imagination and empathy when choosing gifts for boxes. Try to imagine you have no electricity or plumbing or money and barely any possessions. Then ask yourself: what do I really NEED? What they need is water, food, electricity, clothing, plumbing, school supplies to attend school, and a form of light to enable them to do their homework in the evenings and STAY in school. You can’t send them drinking water, but you could send them a water filter straw. (Go and Google it). It might save their life. You can’t send them food, but you can send sweets/candy. You can’t send them electricity, but you can send them a wind-up torch. And you can certainly send clothing. Finally, you can’t send them a plumbed toilet, but you can at least send them some nice scented soap / deodorant / shampoo to mask bad odours, and you can also send tissues and wet wipes for them to use after visiting the cesspit. Thanks for the explanation! It makes sense. I confess that I would have gone with the unscented before reading this. Since you have worked there, can you please answer a question for me? I’ve been looking everywhere and can’t tell. We packed for a 10-14 year old boy this year. Wanted to do a tool kit beyond just the basics, and include a Leatherman multi-tool. Since one of the tools is a small knife, would it get excluded? It’s not inexpensive, and we ended up doing the soccer stuff instead. For a 14-year old boy, though, the Leatherman would be infinitely more useful. Next year? What say you? knives are not allowed, and will be removed upon inspection at the processing center. No candy after this year customs will not allow because of expiration date. I do not get this as customs never sees what’s in our boxes. They are taped shut and boxed with other boxes in a bigger box. The only way they would know is if someone told them . Actually, the scented soap can be a health problem for many. Some brands can cause people to sneeze and if someone has asthma the scent can cause breathing problems. It can also cause skin irritation. This has nothing to do with rich people. If you can find soap that is scented with natural oils, such as rosemary or mint, that’s okay. But if it just says “fragrance” on the ingredient list, that’s a synthetic and an irritant. You might think it smells nice, but it can cause a problem for some people, especially children with sensitive skin or asthma. My Western perspective is 40 years on the Navajo Nation where outhouses abound and only half have plumbing. Electricity is available to about 60% now. But what you describe sounds like overcrowded conditions, not just poverty. The Dine use snow to keep clean in winter and dig new holes for outhouses to keep them from smelling as you describe. They use sweatbaths to keep their scent sweet. Some homes have dirt floors but they are sanitized with a bleach rinse. Please, while I agree that scented soap is fine, don’t paint a picture of poverty that is always so bleak and don’t assume the west does not have areas with third world conditions. Children need hope and fun and love. Stuffed animals and balls and dolls. Shoeboxes do that. While in theory this may sound good, and it a country such as Romania might actually be good for the women there, in African and South American countries where the mosquitoes are prevalent scented soaps can attract mosquitoes causing those using them to contract malaria. While we as privileged westerners enjoy those things they can actually be detrimental to those receiving them. Unless you know where your package is going, be careful sending scented soaps because we see it as a luxury. To them basic soap is a luxury. To you the smell is awful, to them the smell is normal. Many Europeans only bathe once a week and *gasp* a lot of them don’t even use deodorant. Ivory is a great soap to pack Inexpensive, sensitive, light sent and best of all it floats. I enjoyed finding this article. I was looking for a list of items allowed and not allowed to post on a box for collection of items in Church. My girls collect items each year for American Heritage Girls troop packing party. It is a wonderful experience to encounter. I would like to provide a good listing for my girls and for the people donating. This would cover a printable list to be handed out. I know not all of us are computer friendly. Thanks for this information. Thanks for the tips! We were going to pack toothpaste, but thought it might fall into the no liquids or lotions category. However, you mentioned it here. Thoughts? I would include it, but perhaps put it in a little plastic baggie in case it bursts. Put the toothpaste in a ziplock bag. We put toothpaste in the older kids’ boxes but never the 2-4 boxes because the kids just eat it. lol It doesn’t technically qualify as “liquid”, here in the US anyway. I just came across your list as we are finishing up packing our boxes tonight. I always avoid candy for the same reasons, especially in a country where access to dental care is next to none. Do you think sugar free gum has the same problems as candy when it comes to attacking pests? I’m also rethinking the plastic tubs, I love that kids could potentially use them to carry water but I have heard multiple times now that they tend to crack and explode in transit. Thanks for the article, it was useful to read a list from someone who has been at distribution with the missionaries. Question about what you posted about candy. Would putting candy in a Ziploc type bag prevent the kinds of messes and problems with bugs that you mention? Or even double-bagging it? Also, I don’t know if you know this, but in the US, rubber bands are removed from around shoe boxes at the processing center so that they can be taped shut. Maybe people could put rubber bands inside the boxes, though. I think the baggies would definitely help, Mark! That’s a good question! I think including a rubber band in the box might help. I know the boxes we distributed had rubber bands around them, but they were coming from a Canadian distribution center, so that might be why. I appreciate the respectful way in which you left your comment, Brooke! I’m glad we can agree to disagree on some things but focus on the commonalities. I hope you have a wonderful Christmas season this year! I understand your position and have heard this before, but realize that Graham and OCC are just doing exactly what the Jesus commanded his followers to do: “Go into all the world and preach the Gospel, making disciples . . .”; and “Let the children come to me.” The Gospel is offensive to some people but that should not stop believers from going into all the world with it. It gives real hope to not only children, but their families and their friends who also hear the truth. 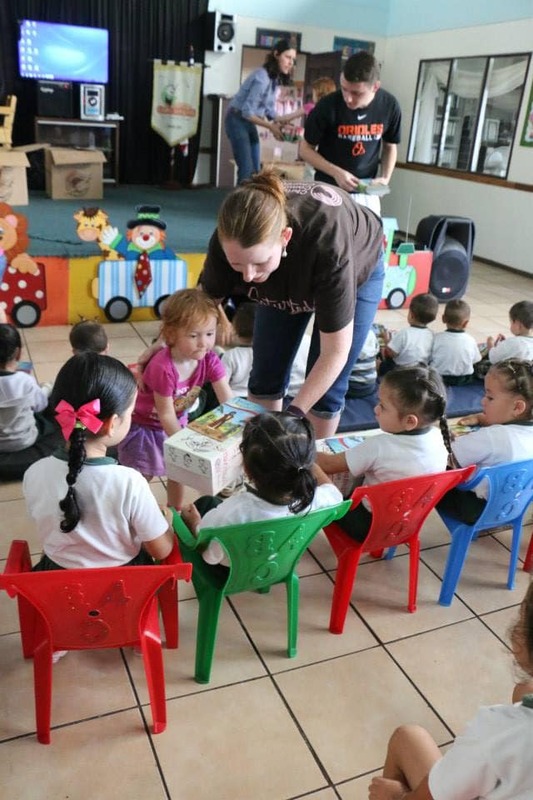 Sending the shoeboxes is one way to be a missionary without traveling overseas. Jesus himself ministered to people in their need and then gave them the truth. We should do no less. Your term “homophobic” is an inflammatory label for someone who in this case is simply honoring God’s Word and standing up for people who have been harassed for not violating their religious conscience. Christians who don’t support homosexuality aren’t necessarily homophobic; that is, they don’t fear it. They simply believe it is against God’s creative purposes and mandates. I agree that the term “homophobic” is very inflammatory. Liberal Christians might want to come up with another term for the many, many Christians who do not fear or hate homosexuals; but do not believe that we should glorify or “accept” homosexuality as an alternate lifestyle. Regardless if you like or agree with him, why make the children suffer for it? You may say well because their teaching the kids the same ideology and you don’t want to support that but their not talking about gays during shoebox delivery. Their talking about Jesus and love and salvation. Here in the Midwest we are encouraged to pack candy (double bagged). The blog referred to cautioning against stuffed animals does not apply to our area either. As the collection coordinator at our large church, I have had many conversations with Samaritan’s Purse about what items are best to pack. I always check with them when there is a question. The lesson I have learned is that there are different guidelines for different areas. We in Induana should pack candy, toothpaste, stuffed animals, etc. Another area may not be able to include those things. The literature that Samaritsan’s Purse supplies to your church or organization is specific to your area. The boxes will be shipped to countries that can accept those items. Also the distribution centers do a great job of checking the boxes and making sure all is correct. Just keep filling those boxes and pray for the children receiving them! – Plastic boxes are definitely best. No, I’ve not seen many broken ones. They’re a little larger, hold a little more, and are something the child can continue to use in the future. Since plastic boxes are see-through, consider “lining” your box with a bandana — who couldn’t use a bandana? – One year I found inexpensive backpacks. I filled them and stuffed them into boxes. I felt good about those boxes. – Another good thing I did once: I found cute metal lunchboxes, and the minute I saw them I said, “Sewing kits for older girls”. We put in scissors, thread, notions, and a couple yards of fabric. – Fewer people pack for older boys — LOTS fewer people pack for older boys. As a result, my own family has chosen ONLY to pack for older boys. This year we packed small tool kits, a few extra tools, bungie cords, and a few other things. I’ve never heard anyone talk about this type of thing, but I felt pretty good about our boxes this year. – Last year we did fishing-themed boxes for boys. We started with a pocket fisherman for each box, and we added a fish tee-shirt and some fishing gear (hooks carefully encased in a little gear box). My husband was heavily involved in those boxes! – Every box arrives with a rubber band, and we’re told to pull them off and save them for the company. They give them to churches to be sure that they have rubber bands for the next year. – We’ve never been told to pull out any type of stuffed animal (i.e., pigs). – One of the “fillers” we’re always given is candy … we’re told to be sure every box goes out with some candy — now I wonder if that’s right. However, we would’ve pulled out the aforementioned melted caramels — hard candies only. If we do find granola bars or chocolates, we dump them into buckets, and they go to local charities. – I save small plastic food boxes (like the tubes that hold Crystal Lite) and pack candies into them. – I’ve definitely seen good boxes vs. bad boxes, and I’m sure it turns out to be disappointing for some of the kids. For example, if my only gift was a pair of too-big shoes, I wouldn’t ‘specially see it as a blessing to be able to give away my only gift to an older sister. – I never once considered sending a soap dish. So simple. When I served at the PC in Minneapolis, we had several of the plastic boxes come out of the cartons crushed or broken on one end. The Processing Center had a ‘box hospital’ where the items were repackaged in another box. I love the idea of a reusable plastic box, I would just be sure to choose a more flexible box rather than the hard plastic. What about a Tupperware Modular Mate (the large rectangular one)? Do you think that would hold up? I see them in thrift stores occasionally and bought one for next year. I don’t want to waste the $ if it’s likely to arrive damaged, though. We’re already collecting for next year. Doing a few 10-14 boy boxes. Love the fishing idea! i have been packing occboxes for over 30 years . all 4 of my girls have been to the processing center in charlotte to help inspect boxes. last year i went for the first time. we removed the rubber bands and the boxes were taped shut. some church groups asked if they could have the rubber bands to use on their boxes the nexy year. they were told yes. i did not like this ideaknowing the bands are helpful to the child that receives the box. most people put the bands in the box when they were taken off. maybe you could somehow inform the processing center of the need for the bands to go back in the box.i love occ and read every blog about it that i can. one day i hope to be chosen to go on a distribution. this year i feel lead to fill 100 boxes. my goal s 10 a month jan-oct. i just packed my may boxes so i am now half way there. it is not nearly as overwhelming when it is spread out over 10 months. i make many of the items for my boxes. craft kits art kits sewing kits fishing kits felt finger puppets felt nativity scenes and other things. i love to sew and craft so this is fun for me plus i pray over the items as i make them in addition to praying for the child that will receive the box. i pray mostly that will know they are loved by me but mostly by Jesus. Thanks so much for sharing your experience, Annette! You are a OCC rockstar, and we can learn so much from you! I love that you collect items and challenge yourself year round. I love how you pray for the kids! I hope you get your dream of going to a distribution at some point!! It would be worth it to write to them and ask!! Erin, thank you SO much for the info! This will be my second year to put together a shoebox. Until I read your post I never thought about the risk of hard candy attracting vermin (duh!). I will able to pack a better box this year thanks to you. Oh I’m SO glad to hear that it was helpful, Cecile! I hope you enjoy packing many more boxes for years to come! I am not 100% sure but I believe it needs to be no larger than the plastic “shoeboxes” they sell at the dollar store and Target. They request you use a standard small shoebox but all of them will go thru. It just makes box stacking a little tricky. The time I volunteered at Boone I saw boxes of all sizes and types and they all went thru and no one said anything about them. I was pleasantly surprised recently to find that the girl that received my shoebox contacted me on Facebook to say “thank you.” I had taped a card with my name and address and my kids’ names and said she could write us if she liked. I didn’t notice the message for 5 months, but it was nice to meet the girl our box went to. She was older than the age category we chose, though. Wow!! That is so interesting–and unexpected! When I was in high school my best friends family introduced me to occ I helped them shop and make boxes for many years. But when I moved away for college and began my adult lift it fell off my radar. In 2010 before Christmas with our first child I found at our local dollar store a pamphlet advertising occ and including box labels and I knew this was a tradition I wanted in my family. It’s been 6 Christmases and we have made boxes every year. It’s a cause that is dear to my heart. Also to add once my children are old enough we hope to be chosen to deliver boxes so they can see where the boxes are going. Thank you for this. I have done this a couple of times, but the things you observed are really helpful for the next time I make up some parcels. Gad bless you. We’ve been doing Operation Christmas Child for almost 10 years in my family. This year is the first that we’ve included a letter and picture of our family. And ordered tracking. So excited at the prospect that we might get a letter back. I’d like to write a blog article about it! Thanks for your article! Would lidded Bubba mugs be an appreciated item? The mugs with handles could be filled with smaller items. I also figure that they are sturdy enough to be used to collect rainwater, and would be an easier way to carry water a long distance. I’m thinking that since it’s likely that they will receive only one box in a lifetime (not once a year), that we should be packing sturdier high quality items. I’ve never heard of those! But I think it’s a great idea! I do think that some of the children do get boxes year after year. They tend to partner with local pastors and church leaders, and they go to the same areas–but are always reaching out to new ones as well. Great idea! This will be the second year a group from our church has gone down to our distribution center to take the tour. We loved seeing everyone happily packing up the shoeboxes. One thing we were told and observed was the boxes that had less in them were “added” to so they would have a nice full box like everyone elses. Next year, I will make sure the boxes have extra rubber bands in them. It is a shame that the rubber bands we put on the boxes don’t just get put into them after they check through the box. Our church did over 600 boxes and we tried to get two bands on each box. I would imagine each year everyone gets better and better at packing the boxes. I’ve already started my shopping for next year. it the processing center I went to we put the rubber bands in the box. Not all are pulled out. I disagree about happy meal toys. These are my favorite to hunt for all year. I get a lot of them from the goodwill for practically nothing. I only buy the “cool” ones though and I either take them out of the pkg or alcohol clean the pkg. You can get some neat toys in those or plush items. I use them as box fillers . I tend to go overboard with my boxes. I buy all year for them when I find sales or clearance. My boxes are way bigger than the tiny ones you can get for free. It’s because I want it to fit a coloring book and notebook flat. Besides that I have big feet so I have big shoeboxes. I usually buy boxes at big lots. Their decorative and sturdier. I am bummed about the candy. I send pez and hard suckers and I’m sad they won’t get them but I never thought about the rat issue. I love OCC. I started with 2 boxes and now I make 12. I have a map on the wall that shows all the places they’ve gone. I coordinate the OCC ministry in my church. I worked hard last year to track down good sturdy boxes, and decorate them so the box itself would also be a gift. I got a ton of backlash on that, but haven’t been able to confirm ANY of it. Maybe you can help. 1) I had people tell me I can only use the OCC boxes, I know this isn’t true. So, I ignored that one. 2) I was told gifts in any other boxes were ALWAYS transferred to OCC boxes?! That makes no sense. 3) Since the boxes i selected were heavier cardboard, to last longer, I was told they couldn’t ship them? I got a standard show box size…just sturdy to be part of the gift. This year we are going back with OCC boxes but I hate how small they are. Any recommendations? We always use the plastic boxes, personally–the shoebox-size ones from the Dollar Store! When we gave them out in 2015, most of them were the plastic boxes or OCC boxes but a few other random boxes were in there. OCC just sent me one of their boxes this year…and it’s plastic but looks like the same design as their cardboard ones! I hope that helps! What a wonderful blog! I want to add my two cents’ worth in response to some of the things that were mentioned. I have been packing shoeboxes now for about 15 years or more (don’t remember what year I started.) I’ve learned a lot about what to pack and what not to pack by reading blogs like this one! 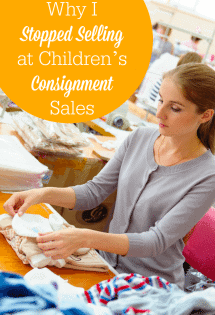 I shop all year for bargains – get many of my items at clearance sales – and then start packing the first of September. I set up an assembly line in my hobby room, and pack several boxes for the same age group at a time. I have gradually worked up to doing around 200 boxes a year – 306 was my biggest year. Two years ago, I had the opportunity to work in the Denver processing center – what a fun time that was! And I learned SO MUCH about packing shoeboxes! I worked as a box inspector most of the week, but also had a chance to work in the “shoebox hospital” for a couple of days. What we did mostly in the hospital was repack MANY plastic boxes that were shattered! Most of them were Dollar Tree or Sterlite boxes. Some did come through ok, but SO many were broken when they were removed from the shipping cartons! Another thing we did was unwrap shoeboxes that had been wrapped shut, rather than wrapping the lid separately. Unfortunately, we were not able to re-wrap them, so they went through as just plain, undecorated shoeboxes. As an inspector, I learned a few thing NOT to do, also. One of the main things I remember seeing that was distressing was the way some people pack crayons. I’m all for sending crayons and color books – I’ve never packed a box without them, I don’t think. However, I saw some boxes come through with a box of crayons, but no color book or paper – NOTHING for the child to color on! Another unfortunate thing I saw was that some people will divide up a box of crayons and put only 4 or 5 crayons in the shoebox – loose – or with a rubber band around them! I saw several broken crayons packed this way, and some boxes had only colors like brown, blue, purple and black! It seems to me that a child would be pretty disappointed to receive a color book and only 4 dark colors! You can get a box of 24 crayons at Walmart for 25 cents during the back-to-school sales – and PLEASE – don’t dump them out of the box! Not only do they get broken, it makes it much more difficult for the shoebox inspector to put everything back as it was after checking the box! (Loose candies were the same problem – but that is no longer an issue since they are not allowed anymore.) Another thing I saw (that was actually kind of humorous, but did cause problems) was OVER-packing a box. I saw one preprinted box that was stuffed so full it was actually ROUND instead of square! I have a tendency to stuff them full, too, but it’s better to use a larger box than stuff them till they won’t close or till they become round. Round boxes don’t pack in the shipping cartons very easily! I think the mention of not including “scary” toys is important, too. So many of the super-hero toys, if you look at them from the viewpoint of a child in a third-world country who has never seen “Spiderman” and doesn’t know what he is supposed to be, could be VERY scary to that child! Just my opinion, but I never buy superhero toys or tee shirts, or towels, etc. 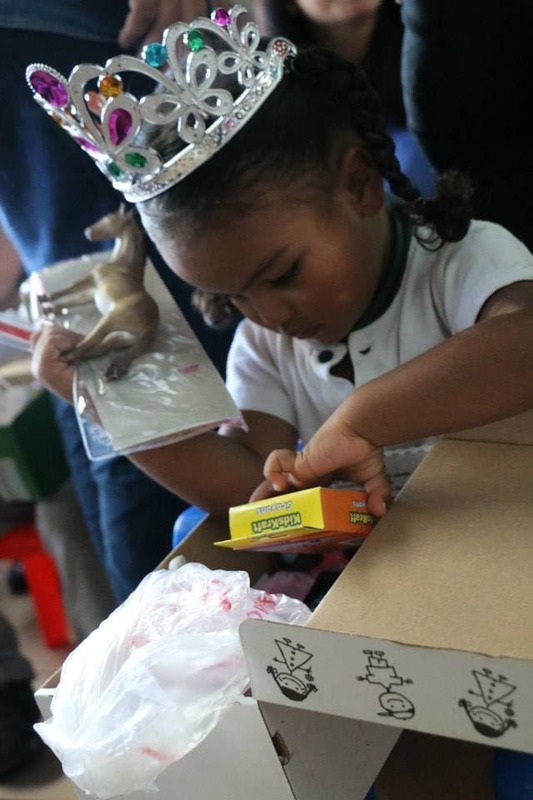 As has been mentioned by several people, the most important thing, whether you pack one shoebox or hundreds, is to pray for the child who will receive that box, and pack it with love! God bless all of you as you pack your shoeboxes this year! You have been a great help. Thank You very much for all of your suggestions.